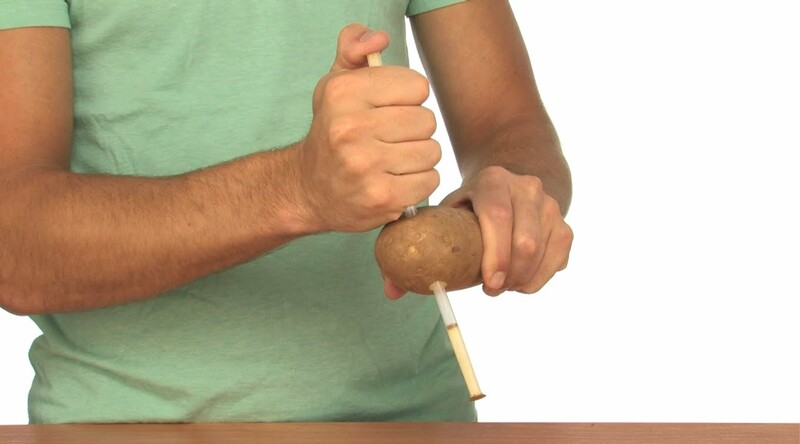 Assembly Idea: Can you get a straw through a potato? What does that tell you? It can be done…..but how? 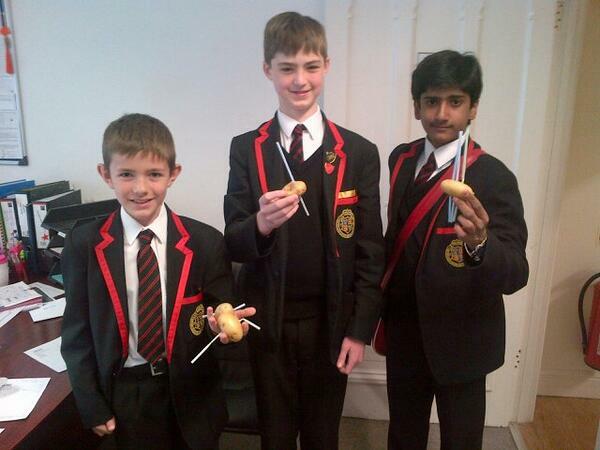 The ‘Straw through Potato’ assembly is one that is often referred to as part of the KEGS banter. It is up there with ‘Lessons from Geese’ and ‘When I Taught The Verve’ as most-remembered (aka most-mocked) assemblies. But I like this one. I first encountered the idea as part of an INSET day at a previous school. In groups, we were all given a straw and a potato with the question “Is it possible to get the straw through the potato?” We proceeded to debate and discuss it; at first we were not allowed to handle the items. Then, after our initial deliberations, we tried out various drilling methods…all to no avail. In my group we concluded that it could not be done. Then the instructor told us how he’d given the same task to some Y10 students with the instruction ‘Get that straw through the potato’. One boy picked it up and ‘bosh’.. plunged it straight through at the first attempt. We felt suitably pathetic. In one assembly I invited volunteers to the stage to try the experiment. It wasn’t a great success… only a couple managed it. I then showed that it could be done…a bit of drama, putting myself on the line in front of 900 students, but luckily it worked. In another assembly I offered a prize to any student who could show me how to do it the following day. I had a bunch of Y7s and Y8s lining up to demonstrate their success… leaving me with a pile of lanced potatoes in my office. I then showed the technique in a subsequent assembly to verify that it could be done. So, what is the point of ‘straw through potato’ – aside from the physics of it? 1. If you plant doubt, it can be self-fulfilling. By suggesting that it might not be possible, sure enough, some people conclude that it is impossible. But if you simply ask ‘how can it be done?’, the question is not ‘if’ but ‘how’. This has implications for how we present problems in lessons. 2. Trial and error and testing things out will often lead to better solutions than lots of debate and discussion about what might work in theory. It’s a hands-on solution; it’s physical. 3. Sometimes a direct approach is the best solution – just go for it. Do it. Believe that the straw will go through in one stabbing motion. 4. The satisfaction of that stabbing action, penetrating the potato, is quite addictive. Try it. You immediately want to do it again. Overcoming a difficulty and experiencing success is a great feeling – even if it is just stabbing a potato. Avoid bendy straws – or cut off the bendy bit. Test out the potatoes first.. some are too big or too hard for any straw. MacDonald’s straws are good. Have a pre-prepared success on hand in case your live effort doesn’t come off. Love it. Nice short vid that leads to further experimentation. Nice. Can’t wait for your ‘Lessons from Geese’ post. Hi Marvin – it’s already on the blog..part of a Leadership Lessons from Geese post. The slides here http://www.slideshare.net/fullscreen/headguruteacher/geese-14161962/3 could be used in assembly. I really like using physics tricks at every opportunity! Good to see one making it into an assembly. Of course, you could do a follow up assembly using balloon kebabs (http://www.physics.org/interact/physics-to-go/balloon-kebabs/). Perhaps to show that sometimes a slow and steady approach is needed.